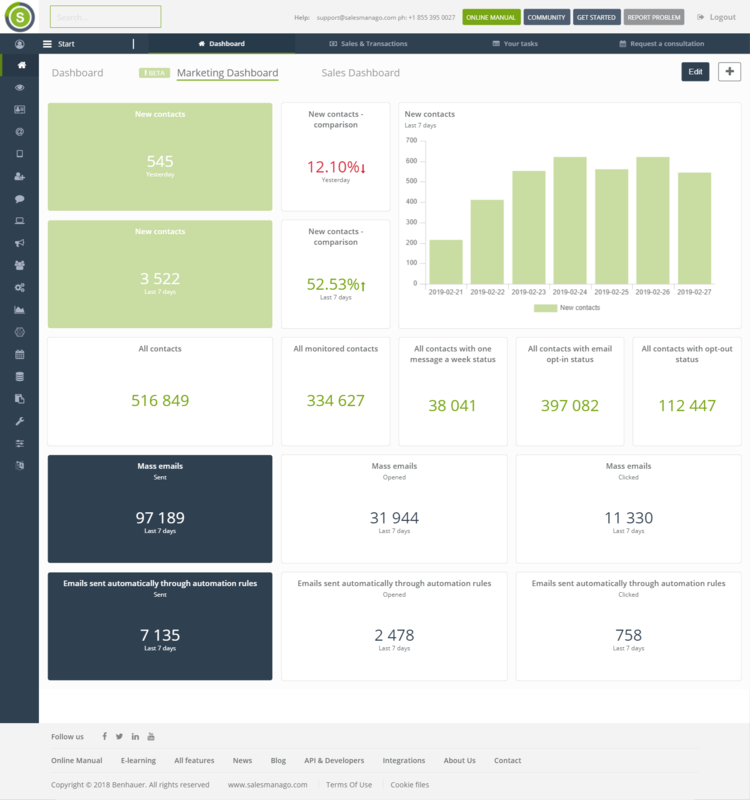 Business dashboards are the analytical panels which enable your own configuration of the dataset. You can decide what kind of statistics you want to see once you log into the system. This way all parameters received through the ongoing campaigns become measurable, and what’s more, they can be analyzed and the activities optimized. 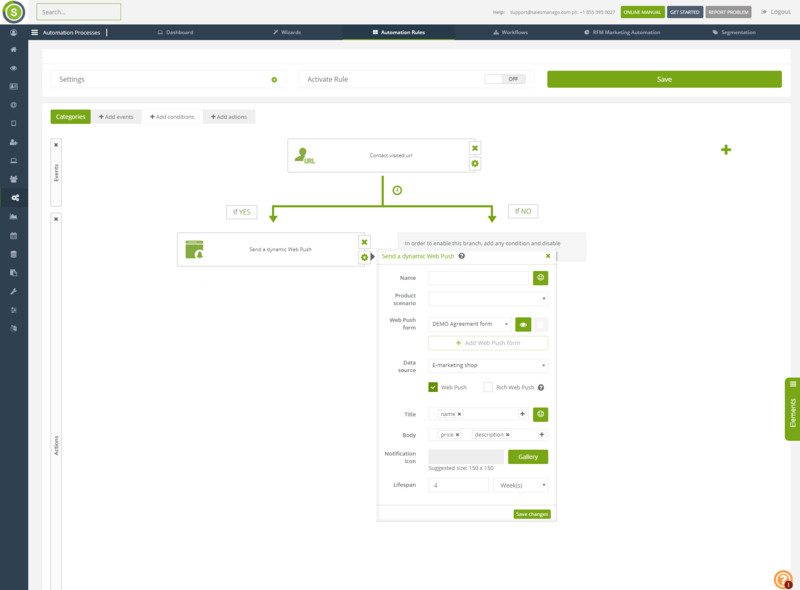 Thanks to new interface and way of creating workflow campaign, complex processes become even easier. 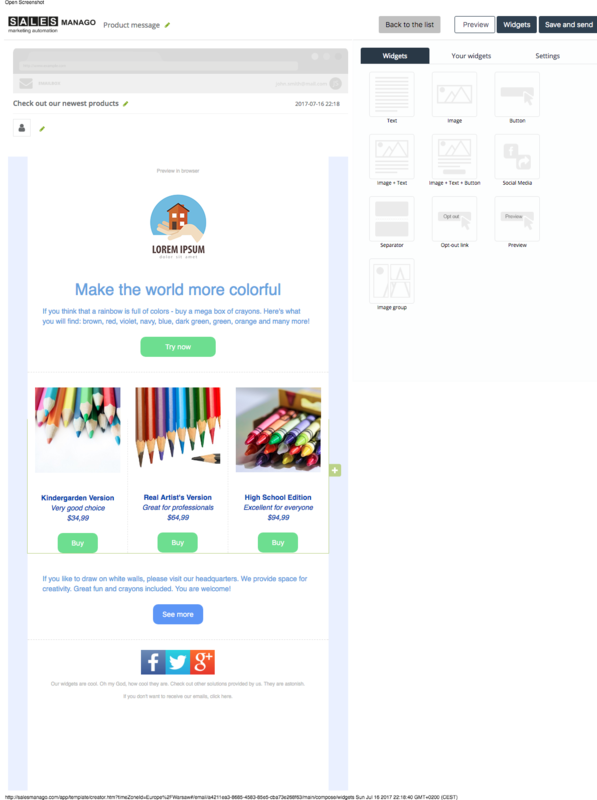 Enrich your campaigns by using A/B/X tests and alternative paths. 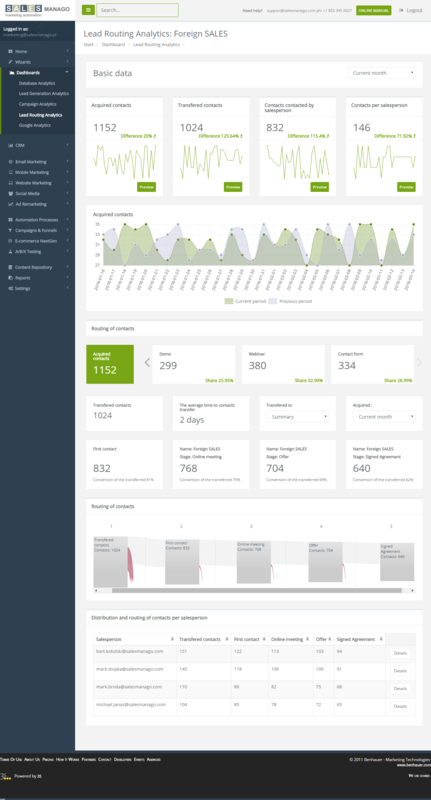 New analytics will help you to be more effective at marketing and sales processes. 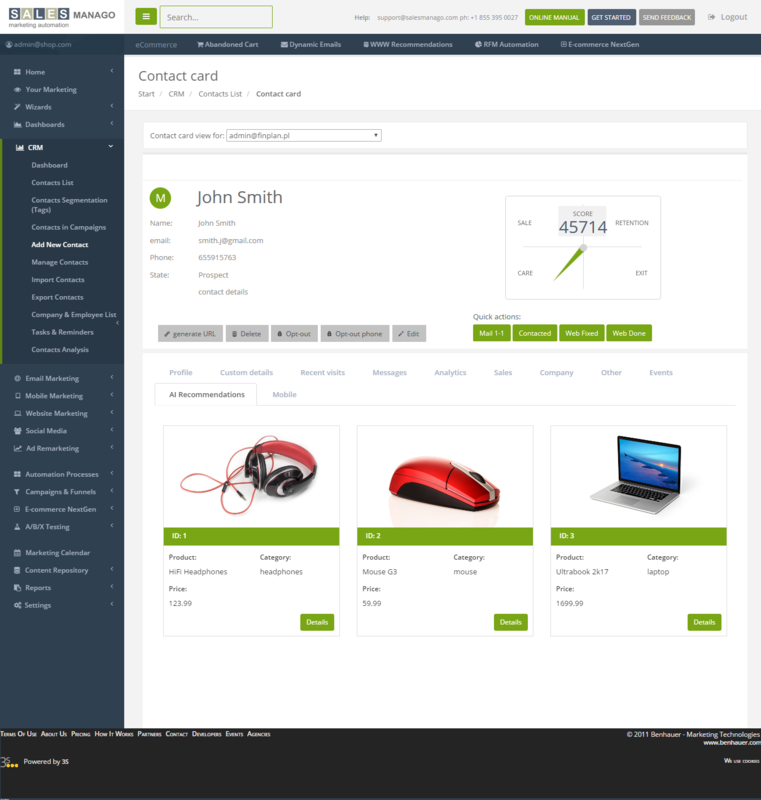 A contact card is the core of the CRM module in SALESmanago. It contains all pieces of information that have been gathered about each contact and the contact’s activity. The contact card is created on the basis of the email address of the user. Being updated in real time, the contact card proves to be extremely useful while choosing the marketing strategy towards a particular user. 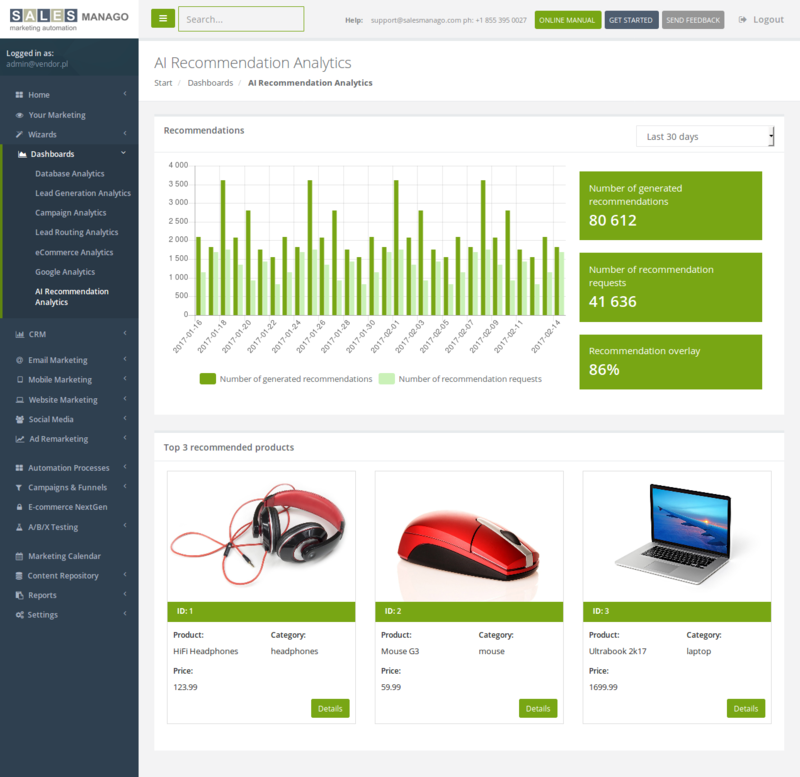 AI Recommendations analytical panel in SALESmanago Copernicus module will provide you with the advanced data about product recommendations based on the artifical intelligence in your online shop. Live Chat Analytics is a collection of necessary information that will let you verify the consultants’ effectiveness, customer satisfaction rate, the contact base growth because of the Live Chat contact forms and URL addresses on which customers use Live Chat the most frequently. Take advantage of the simplified method of adding XML files to the system. They will enable you to send dynamic emails and display personalized content on your website. 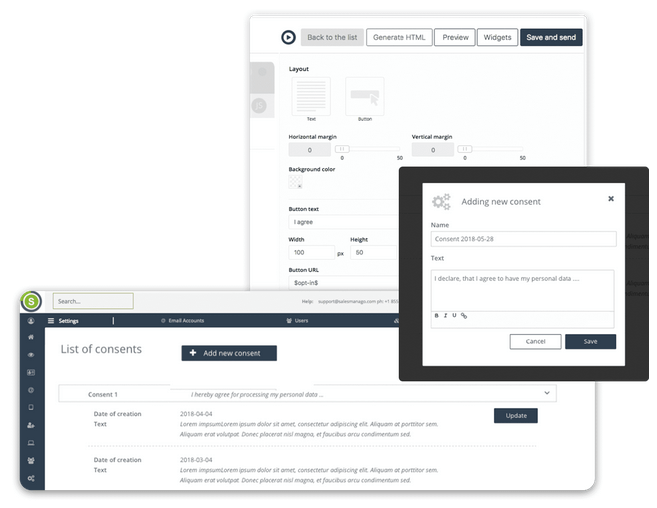 Manage consents panel is not only a diligently prepared tool for creating consents but also for supporting you in performing your tasks in compliance with the new law regulations. You can edit consents whenever you want, add them to the forms and control their statuses on the contact cards. 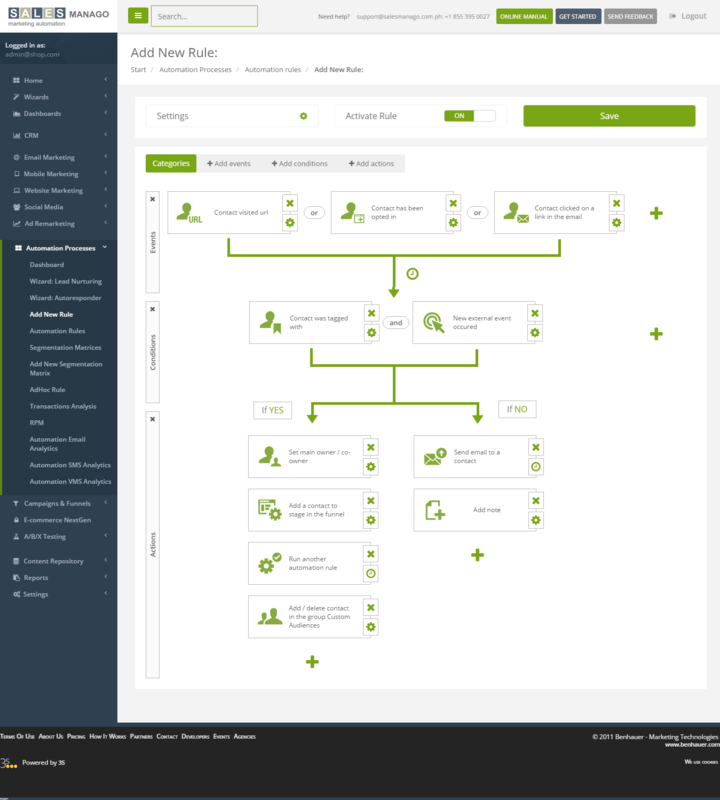 The list of automation rules lets you analyze, search and perform the group actions for the selected rules. 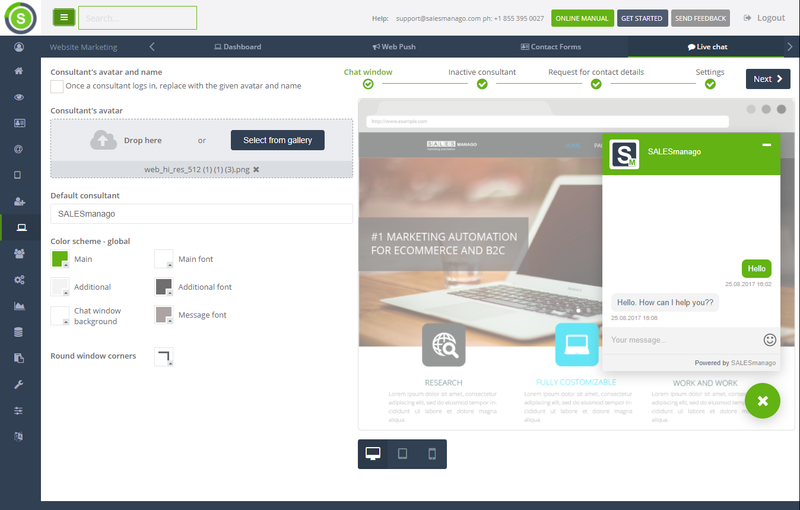 Automate your marketing activities in a convenient way. Choose the products from your shop to an email and send recommendations designed from scratch by you. Recover abandoned carts and recommend recently viewed products with the dynamic Web Push notifications. Send the notifications with product recommendations by means of automation rules. 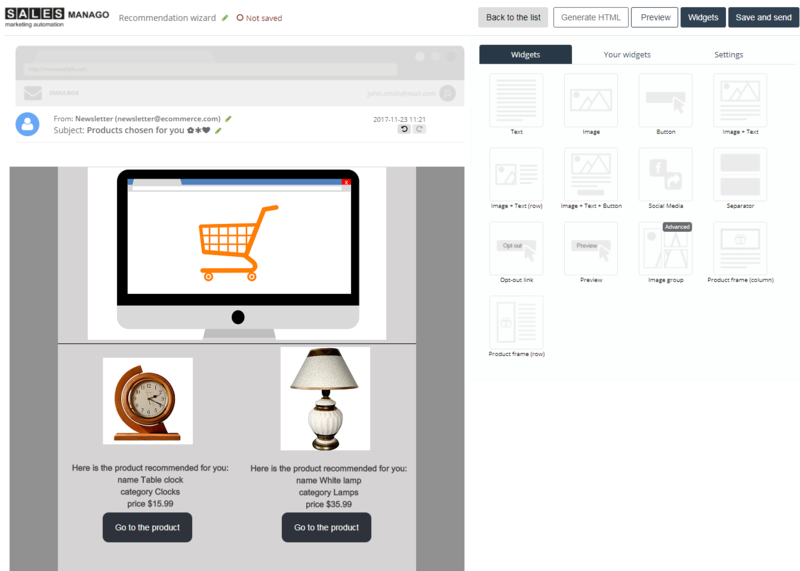 Widget Frame with product to choose allows you to select independently products to your dynamic email. Ordinary product frame works on the basis of automatic placement of products from an abandoned cart or last visit, depending on which type of recommendation you choose. Monthly reports take the form of a summary of the activities on the SALESmanago platform. Thanks to their clarity you can quickly verify the results that you achieve within given module in the system. Boost your sales by means of the dynamic emails wizard, which enables automatic matching of the offer to each customer’s needs on the basis of the website visit. Thanks to the widget, that you can find in Drag&Drop Email Designer, you can send emails with product recommendations and products from abandoned carts. Create email templates with the products, which have been added to a cart but haven’t purchased. Combine it with the suitable automation rules and save effectively abandoned carts or send recently viewed products. 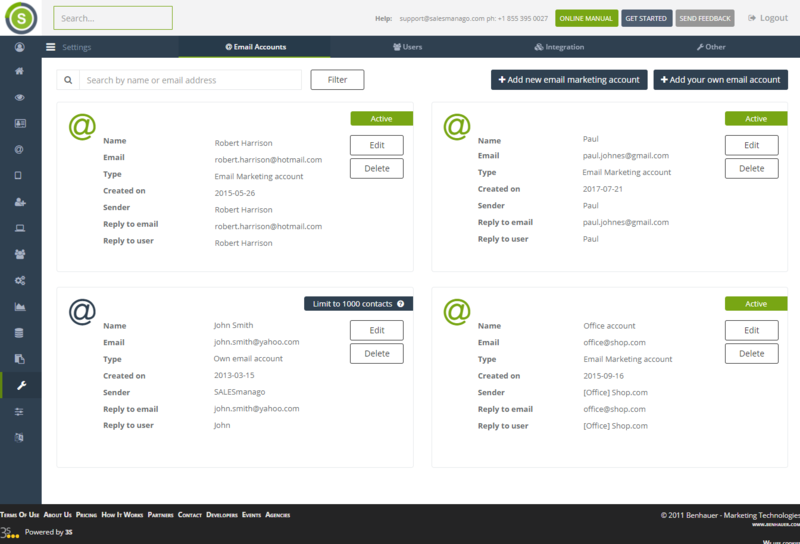 A refreshed and clear view of email accounts will facilitate management of your email sender list and their settings. 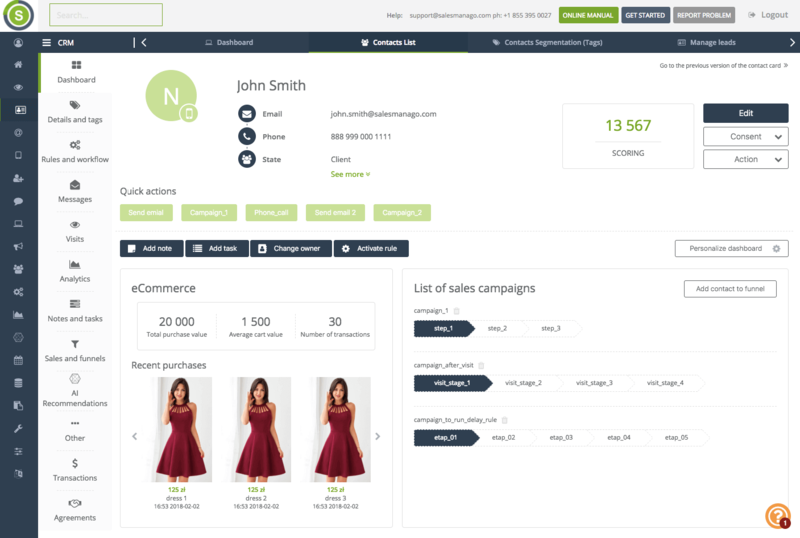 SALESmanago Live Chat, designed especially for ecommerce & online stores, makes it possible to solve problems, support customers and sell products and services effectively, all in real time. 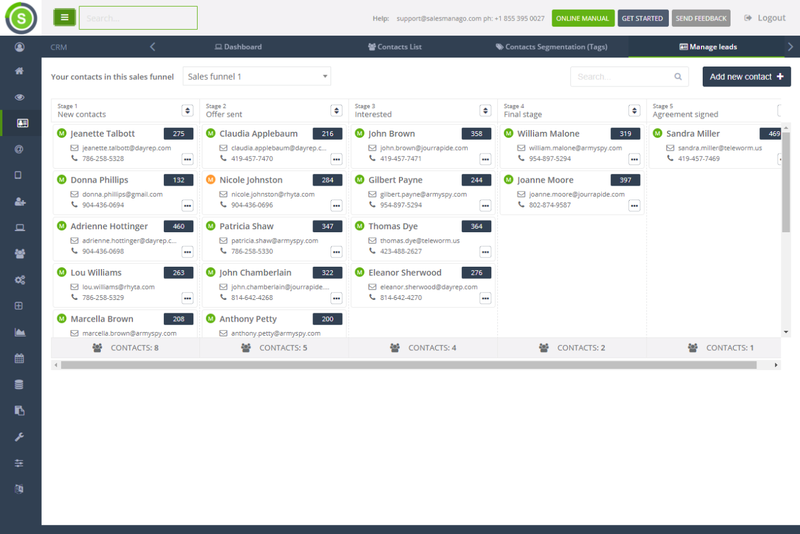 Manage Leads panel enables your sales team to control sales process in beautifully designed drag & drop visual funnels keeping the entire process simple and fast. 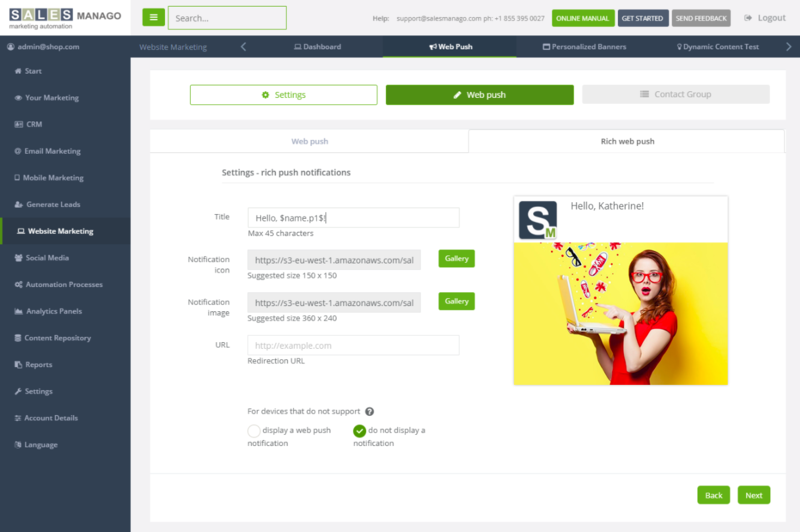 Rich web push is a completely new look of notifications that allow you to communicate with even anonymous users and those who have left your website. In addition, notifications allow you to increase website traffic by 45%. The new, streamlined Email Drag&Drop Designer lets you design fully responsive email templates, messages, and newsletters. 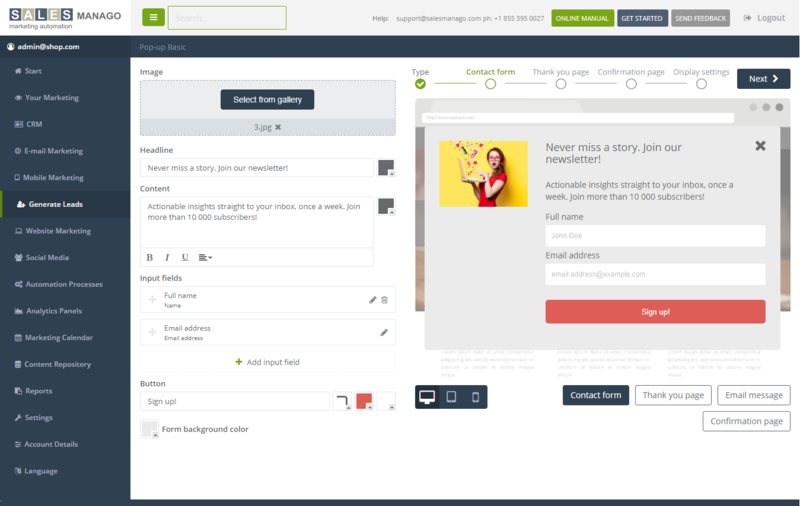 Create and send top-notch messages in under 5 minutes, without IT support. Easily design clean, eye-catching pop-up contact forms in the new Express PopUp designer. In just a few minutes you can have a stunning pop-up form on your website, converting leads and driving sales. Keep all your graphic files in one place with the new Image Gallery. Having all your files neatly organized and readily available you can focus on your current project – be it an email template, contact form or other content. The new Lead Generation analytical dashboard offers a comprehensive and dynamic overview of visitor activity on your website, displaying real-time traffic analytics to empower your decision making. AI Recommendation Analysis – is based on a thorough investigation of customers activities between purchases as well as on identification of frequently repeated purchase paths that resulted in completed transaction. Customer activity – presents recommended, selected for each customer products based on their individual purchase paths – Customer Journey. 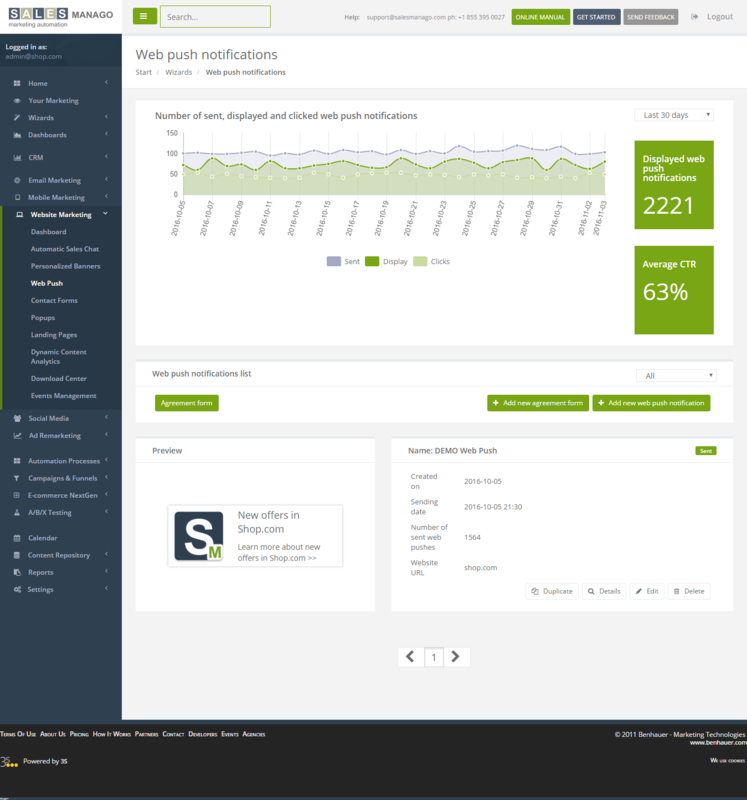 Detailed automation rules analytics provides data on the frequency of rule execution for particular contacts and, in case of sending emails presents statistics of the campaign. 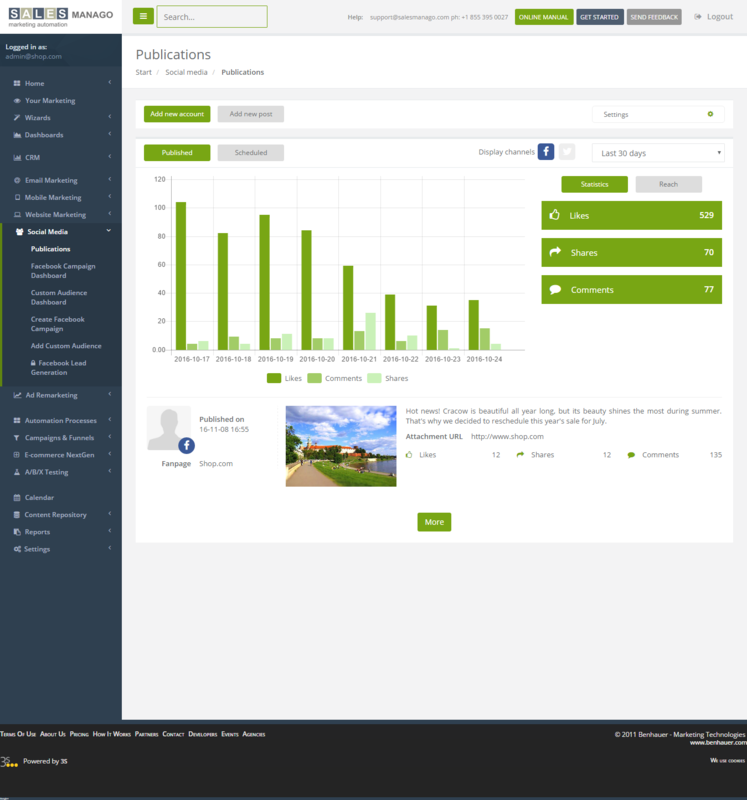 Publications in Social Media allows you to integrate Facebook or Twitter profile with SALESmanago account, insert post content and share it on your fanpage or Twitter account. This tool enables you to plan post publication on a given day and in a particular hour. Web Push Notifications allow users to run personalized communication with anonymous users. The anonymous contact has to enable pushes while visiting the website, without leaving any data. 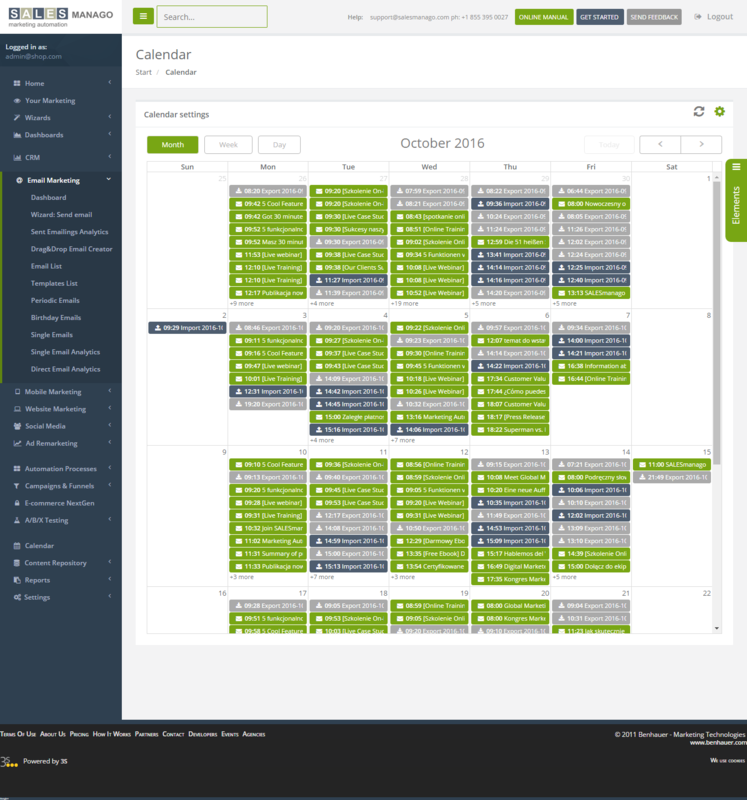 SALESmanago Calendar allows you to prepare your whole marketing strategy in one place. Now you can easily evaluate the number of weekly or monthly outgoing emails and arrange your actions in chronological order. Your Marketing is a tool, which gathers and analyzes the marketing progress within the SALESmanago platform. A graphic analytics of implemented solutions and the list of tips and directions steer users towards activities which allow to leverage the potential of the system, to gain even better results. 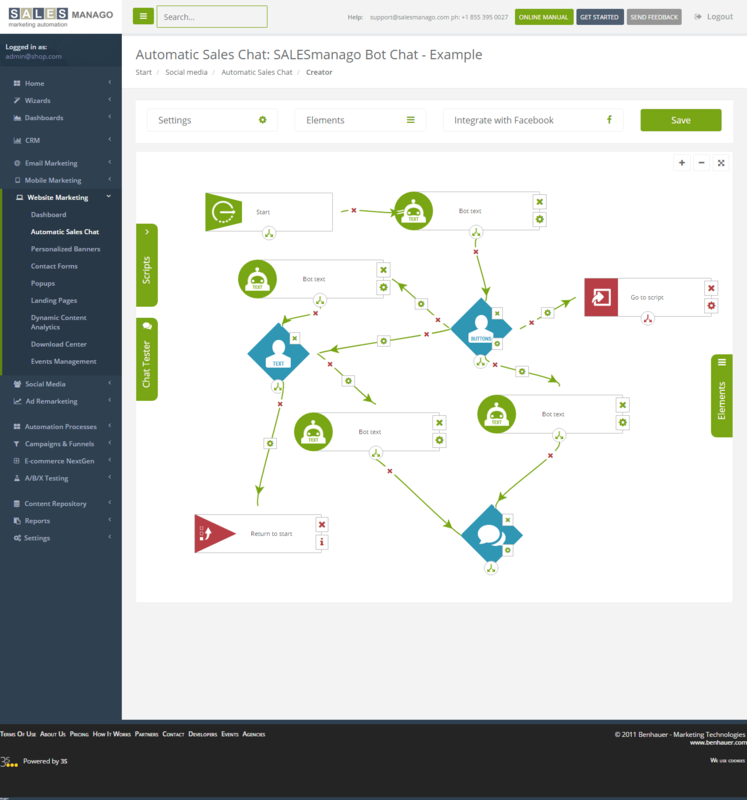 Automatic Sales Chat is a robot, which is synchronized with the Facebook page. It can replace customer service and assist customers in purchasing. Chat can display products, redirect users to specific pages, display buttons that, after clicking show product descriptions, categories, or information about the available colors. 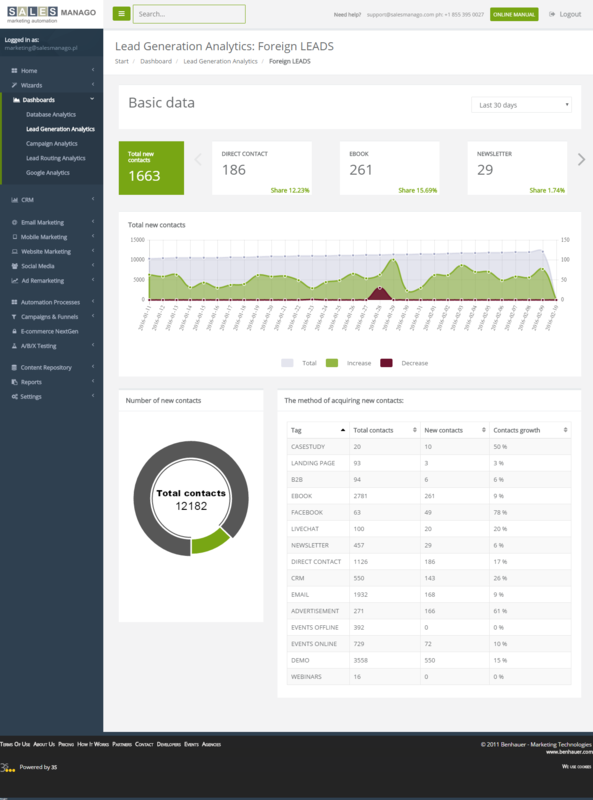 RFM Dashboard allows to conduct highly detailed customer analysis. Due to generating specific data it is possible to distinguish regular customers, cyclic customers and customers that need to be fought back. 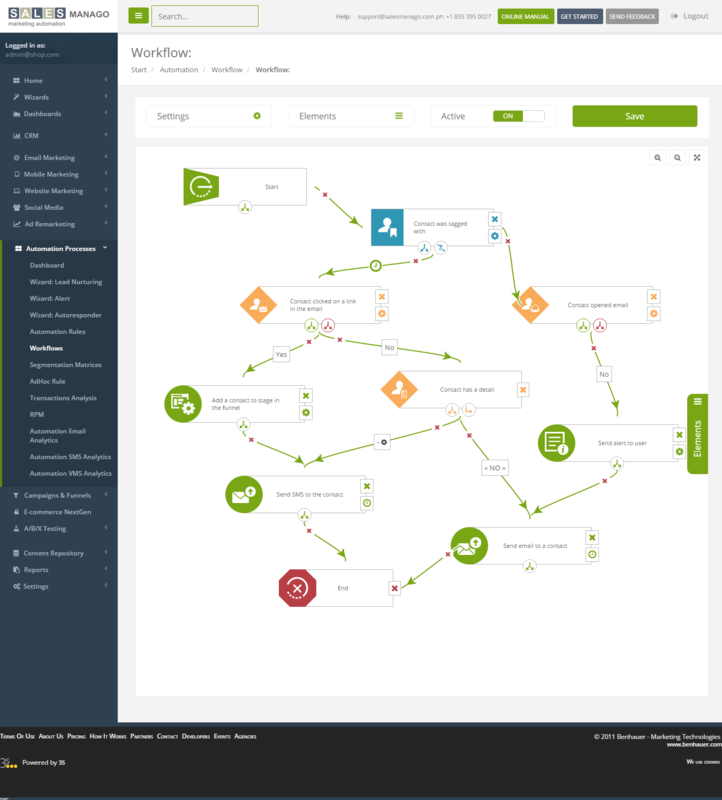 Creator Workflow enables creating multilevel automation processes. 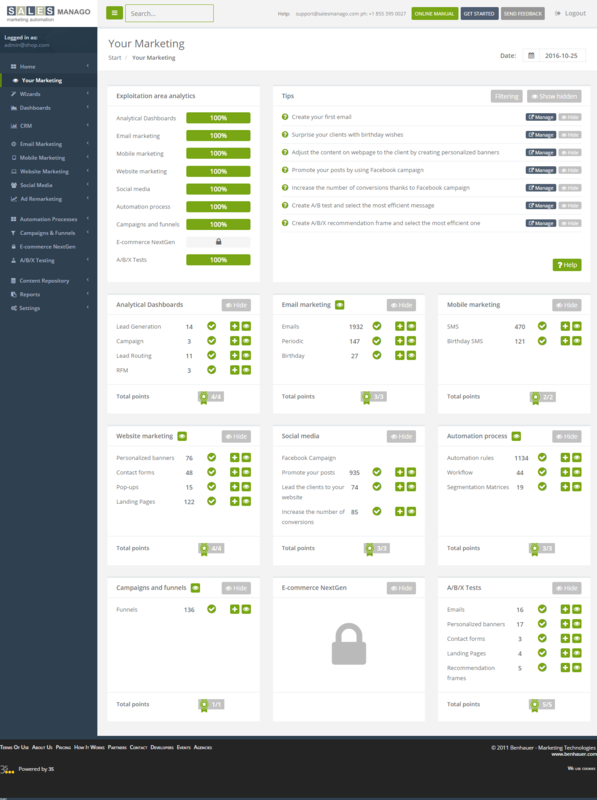 It will let you organize and automatize marketing and sales processes, even more efficiently than before. 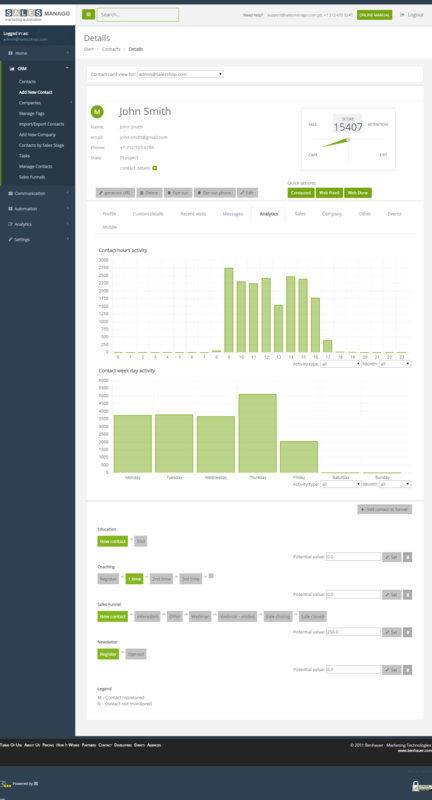 Mailing Analytics offers you a simple way to view detailed statistics of mailings you sent as well as make reports. 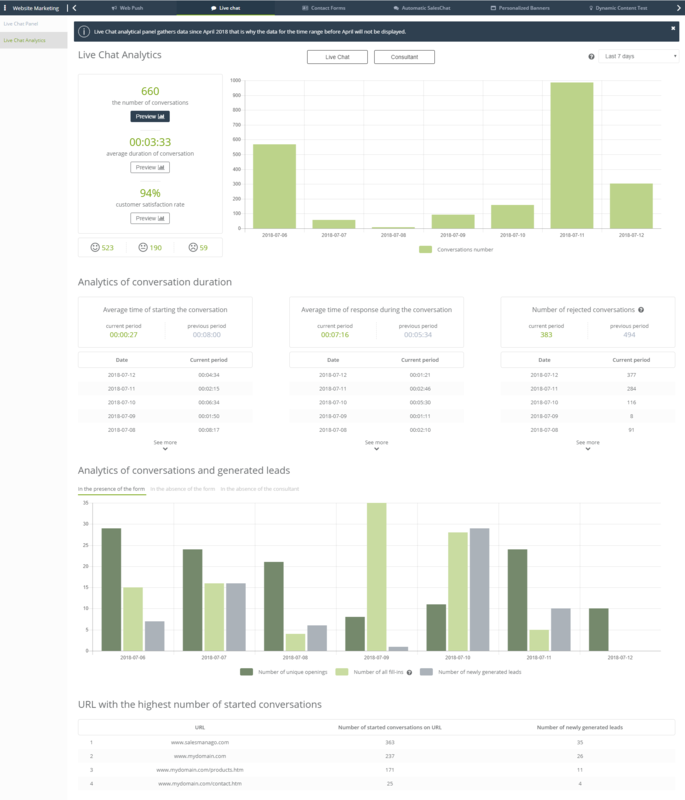 Other than basic information, analytics dashboard presents emails engagement hourly statistics of contacts and top 7 domain statistics. Using automation rules you can automatically react to behaviours or profile changes identified for contacts recorded in your database. 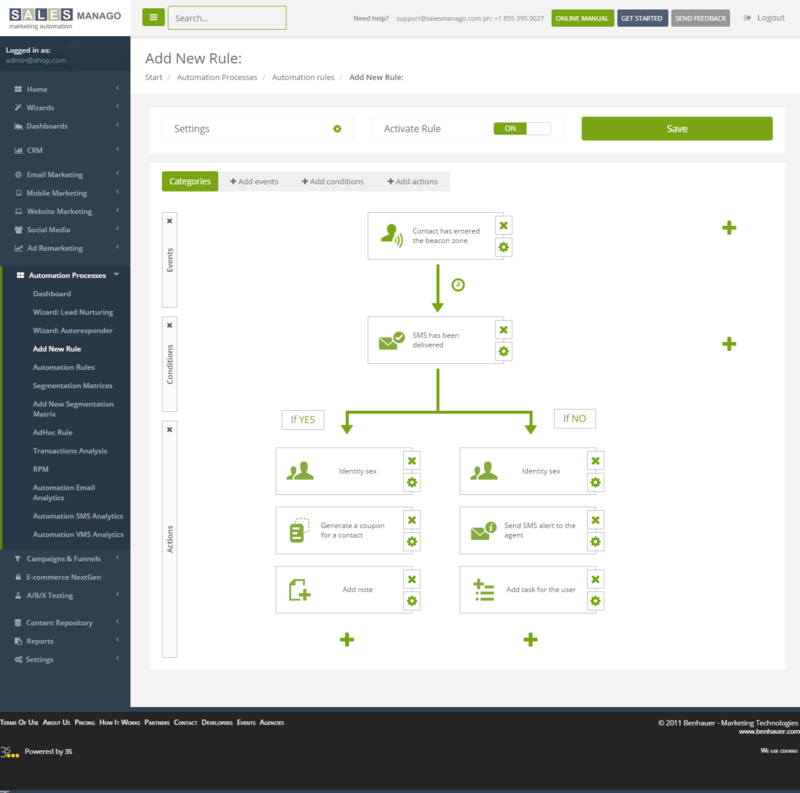 With automation rules, users can automatically perform most of marketing activities addressed to their target customers. 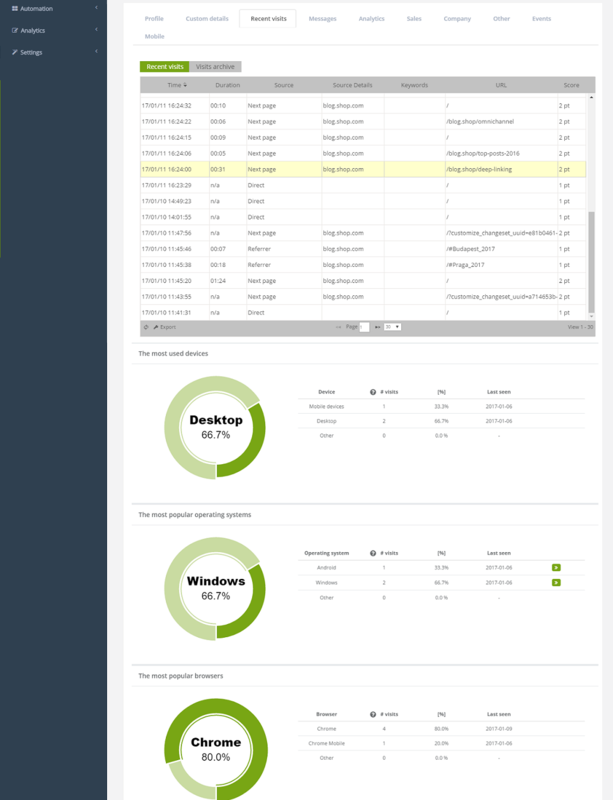 General Base’s Analytics – Basic information about the status and activity of the contact’s database in SALESmanago system. 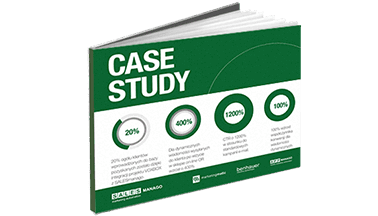 Lead Generation Analytics – It shows the total number of contacts acquired from the indicated sources and per specific source, always in relation to the previous period. 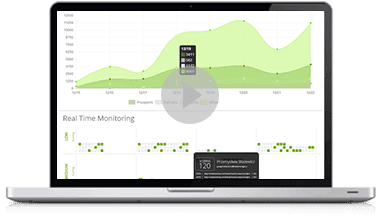 Lead Routing Analytics – Customizable dashboard, allows you to keep a precise control of marketing and sales campaign within SALESmanago system. 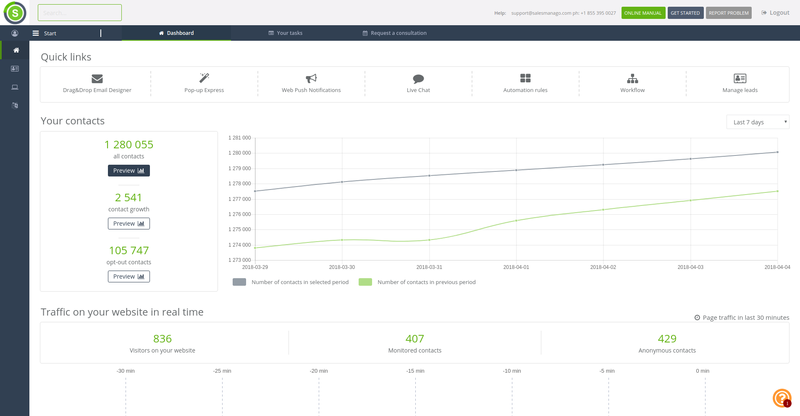 Campaign Analytics – Precise control over the campaign of marketing and sales within SALESmanago system. 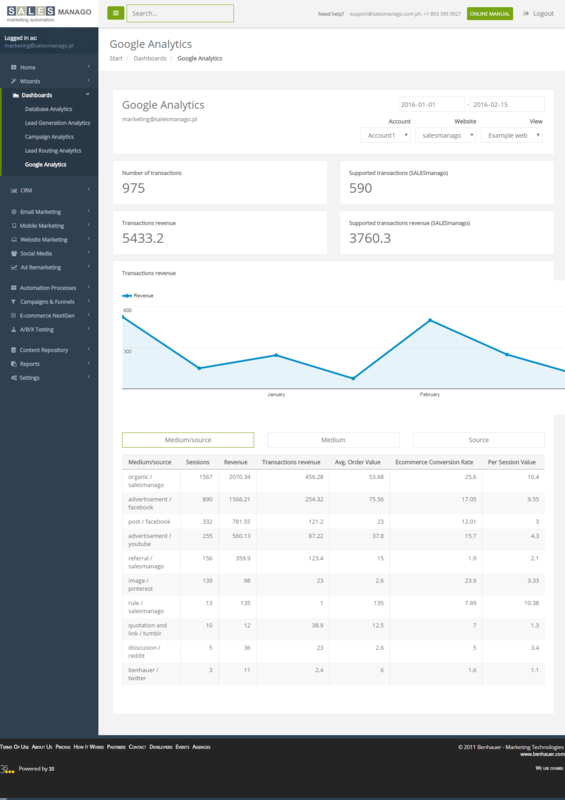 Google Analytics Dashboard – Through integrating SALESmanago with Google Analytics, the system automatically displays the number of transactions generated by the company. 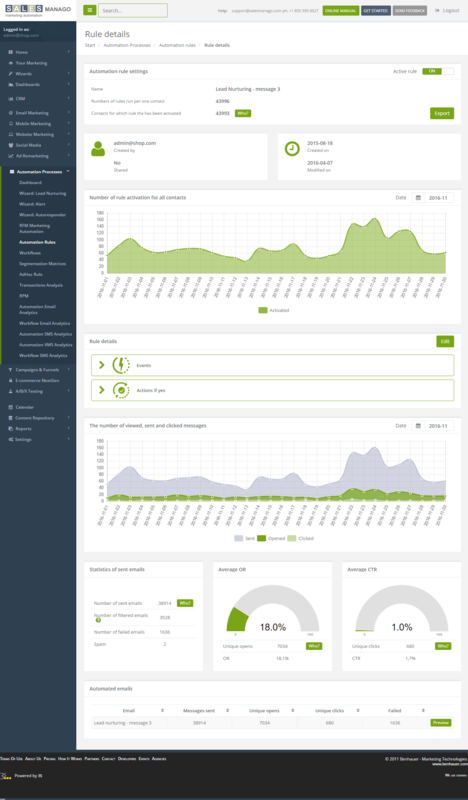 Dashboard with basic statistics, shows the current information on the use of your application. Contact Details Card – 360 customer view contains all behavioural & transactional information both desktop and mobile devices. Contact Card Analysis – gives us access to information about specific users, their activity during the day and during the week. 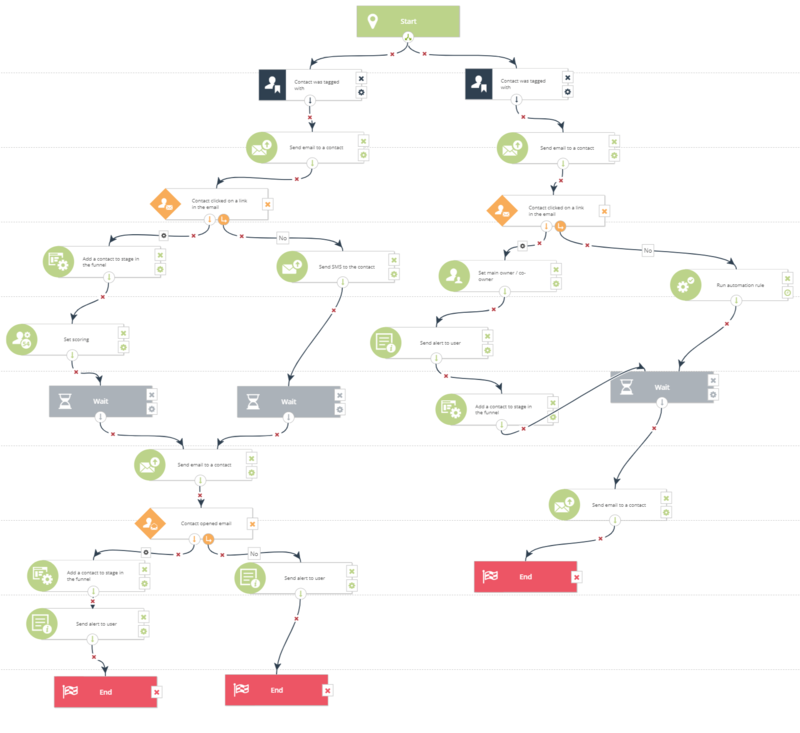 Sales Funnels Analysis – provides information on flows through the stage, to provide better Lead Nurturing. Dynamic emails are marked by the wholly personalized content that refers to the interest of each contact to which the message will be sent. In such email, the products are adjusted automatically, these are the products which the user has seen for example. The form appears on the website and contains fields that a contact can fill in. SALESmanago lets you create and set your own contact forms in express designer in several minutes.